The Leaning Tower of Pisa or simply The Tower of Pisa (La Torre di Pisa) is the campanile, or freestanding bell tower, of the cathedral of the Italian city of Pisa. It is situated behind the cathedral and it is the third structure in Pisa's Campo dei Miracoli (“field of miracles”). 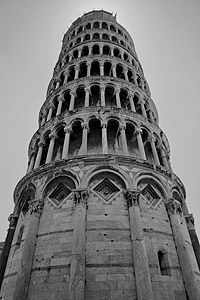 The leaning tower of Pisa is a cultural icon that perhaps symbolizes the human ability to sometimes almost defy nature. It amazes many observers that the tower has not given in to the law of gravity, although it is in danger of collapse. The leaning tower of Pisa leans by accident, not by design—yet it was constructed in such a way that it has resisted the pull of gravity. There is an unusual beauty and elegance to the tower, too, so much so that even were it not a leaning tower, it would attract attention as a cultural artifact. The tower began leaning to the southeast soon after the onset of construction in 1173 due to a poorly laid foundation and loose substrate that has allowed the foundation to shift. The Tower of Pisa was a work of art, performed in three stages over a period of about two hundred years. Construction of the first floor of the white marble campanile began on August 9, 1173, a period of military success and prosperity. This first floor is surrounded by pillars with classical capitals, leaning against blind arches. Today, it is still unscarred despite enduring centuries of weather and age. The height of the tower is 55.86 meters (183.27 feet) from the ground on the lowest side and 56.70 meters (186.02 feet) on the highest side. The width of the walls at the base is 4.09 meters (13.42 feet) and at the top 2.48 meters (8.14 feet). Its weight is estimated at 14,500 tons. The tower has 294 steps. There is controversy about the identity of the architect of the Leaning Tower of Pisa. For many years, the design was attributed to Guglielmo and Bonanno Pisano, a well-known twelfth-century resident artist of Pisa, famous for his bronze casting, particularly in the Pisa Duomo. Pisano left Pisa in 1185 for Monreale, Sicily, only to come back and die in his home town. His sarcophagus was discovered at the foot of the tower in 1820. On February 27, 1964, the government of Italy requested aid in preventing the tower from toppling. It was however considered important to retain the current tilt, due to the vital role that this element played in promoting the tourism industry of Pisa. A multinational task force of engineers, mathematicians and historians was assigned and met on the Azores islands to discuss stabilization methods. After over two decades of work on the subject, the tower was closed to the public in January 1990. While the tower was closed, the bells were removed to relieve some weight and cables were cinched around the third level and anchored several hundred meters away. Apartments and houses in the path of the tower were vacated for safety. After a decade of corrective reconstruction and stabilization efforts, the tower was reopened to the public on December 15, 2001. It was found that lean was increasing due to the stonework expanding and contracting each day due to the heat of sunlight. This was working in combination with the softer foundations on the lower side. Many methods were proposed to stabilize the tower, including the addition of 800 metric tons of lead counterweights to the raised end of the base. The final solution to preventing collapse of the tower was to slightly straighten the tower to a safer angle, by removing 38 cubic meters of soil from underneath the raised end. The tower has been declared stable for at least another three hundred years. All links retrieved Julne 22, 2018. 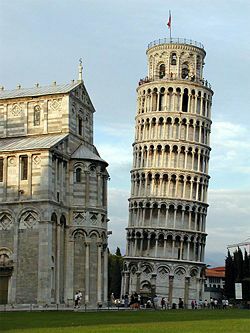 History of "Leaning Tower of Pisa"
This page was last modified on 22 June 2018, at 14:50.